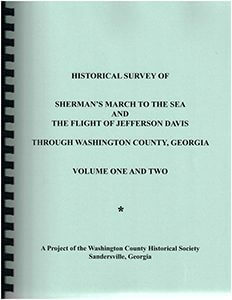 During the last week of November 1864 both wings of Sherman’s army converged for the first time since the battle of Atlanta in Washington County, Georgia. There these Northern Troops met the first Confederate resistance on the March to the Sea. In May of 1865, Jefferson Davis passed through Washington County during his flight to Texas. Washington County, Georgia is the only place in which both important historical events occurred. The stories are told through personal letters, diaries and official records. Detailed maps, photographs, and rosters are included. Volume One documents the Northern View, while Volume Two addresses the Southern View. Comprehensive bibliographies document the sources.